In 2011, the group became associated as the Kingsport Fitness and Wellness Society, and they began applying for grants and raising money for equipment. They were awarded a $10,000 Positive Aging grant from the Department of Seniors, which allowed them to purchase equipment for circuit training. Up until this point, the group had been mostly women, but the circuit equipment attracted more men to exercise. Today, the Kingsport Fitness and Wellness Society has grown to include more than 100 regular attendees and offers six different programs throughout the year. They continue to rent space in the Lloyd Community Centre, but they’ve outfitted it with their own brand-new gym equipment. They’ve also trained all of their own instructors. Christine Heap leads stretch and cardio classes three mornings a week. Irene Burrell runs a one-hour circuit training class, and also conducts an AquaFit class in her own backyard pool. Niamh Webster is offering a Muscle Memory and Movement class this September. Amos took a yoga instructor course and began teaching yoga classes — even holding them in the beautiful garden of her home during the summer months. “I’d like to also schedule in a new yoga class geared toward seniors, because it’s a great way to connect the breath with movement, and loosen up the joints and muscles,” says Amos, who serves on the society’s executive. For long-time member Jerry Anderson, exercising with the Kingsport Fitness and Wellness Society has meant more to her than she can express. 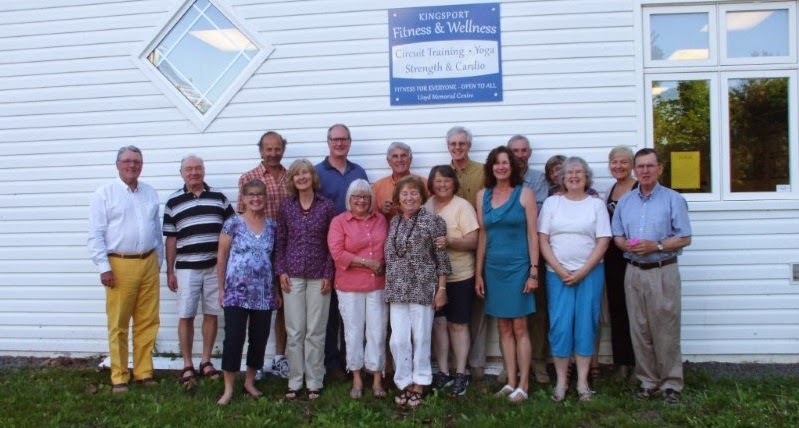 For more information on the Kingsport Fitness and Wellness Society, please call Melanie Amos at (902) 582-7700 or Christine Heap at (902) 582-1624 or visit kingsportfitnessandwellness.blogspot.ca.